On the 10the anniversary of the premiere of “An Inconvenient Truth” and as a Climate Reality Leader, a reflection on what this documentary meant for the fight of humanity against climate change. Two weeks ago I had the chance to return to make a presentation as Climate Reality Leader to high school students in my beloved city of Buenos Aires (Argentina). As part of the “School of Neighbors” initiative, the goal was that children obtain information on the subject and can clear their doubts about an activity not easy that I daily performance: communication of climate change. Were precisely these two concepts (communication and climate change) that let me share this story that was developed that afternoon. 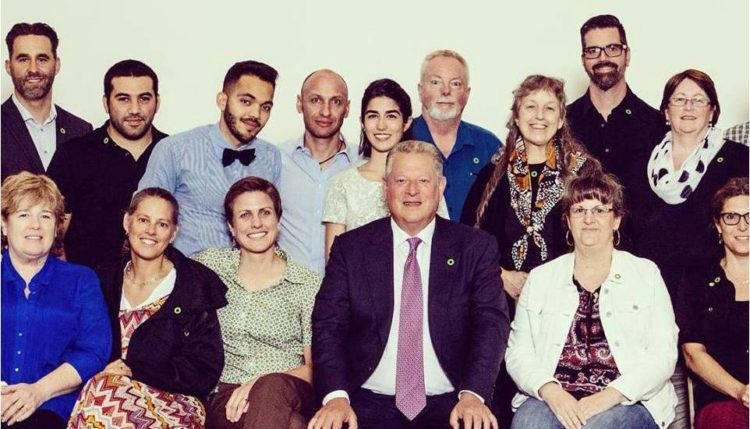 When I mentioned my specialization in climate change as part of the Climate Reality Project training, I named (of course) to his ideologue par excellence: Al Gore. But soon, I saw faces of ignorance in these young people attentive to each of my words. In response, I asked, “Do you know who Al Gore is?” Heads moved to one side and the other giving a negative signal. “Not a former US vice president sound?”, I continued with my question. And something fearful for not knowing the answer, they again replied negatively. And there I decided to do what I knew would be the perfect link, the tie balance, the meeting point between that time of communication and the problem of climate change: “Did you watch ‘An Inconvenient Truth’?”. Almost immediately I begin to name the title of the film, smiles appeared on those previously fearful faces, and the movement of their faces went on to make a side and to another but from top to bottom. The answer was yes. What was a time of a few minutes and now it just seems a story, is a symbol of what “An Inconvenient Truth” has meant in the lives of hundreds, thousands, and even I dare to say, millions of people around the world. While Al Gore was the incomparable star of this masterpiece, which highlighted “An Inconvenient Truth” was the ability to transcend its director. The message was more important than the messenger: climate change was a reality and as human beings and mainly responsible for the problem, we should act. Perhaps myself 10 years ago, when I began my university studies in communication to be a journalist, I hadn’t in mind in detail the figure of Al Gore. But something was true: that night I decided to see alone “An Inconvenient Truth”, the course of my profession and my life changed forever. While the link with nature and care for the planet kept me from a child (for those rare reasons why I stopped to eat red meat, for example), were those visually perfect images and riddled information which marked in me a clear mandate: I have to do something for the planet, I have to give my contribution also from communication, I have to write and talk about climate change and ways to adopt a more sustainable lifestyle. My brief racconto about my first link with “An Inconvenient Truth” is just one among millions around the world, which I am almost certain, marked a before and after. If anything this film project managed (plus valuable awards from the Film Academy to the same Nobel Prize), is to the big screen (and then to the small households) out a problem about which few (yes few only 10 years ago) they dared to speak, a fact that bothered many, a problem that bothered and on which it was necessary to start acting. But if something is true is that “An Inconvenient Truth” is a documentary and, as such, had remarked the resurgence of environmental cinema 10 years ago. It meant an awakening of interest to production and audience in the possibility of cinema, not only to entertain with Hollywood movies, but also to highlight the social, political and environmental situations we live in these times, to cause a call to action. Does cinema the best choice for this? In fact, after “An Inconvenient Truth” were several who began to join in the task of making the cinema a mean of expression on the subject, from Leonardo Di Caprio himself to Yann Arthus-Bertrand. Climate change is a reality and is a product of human activity. And that is something that even today, in 2016, remains an inconvenient for many. Even for some who, like a defense, seeking to “launch attacks” against Al Gore and his own environmental footprint product of the number of trips he made. I do not know the efficient house of Al Gore, but I was in his trainings. More than 350 people in Rio de Janeiro (Brazil), where I was trained; more than 700 people in Toronto (Canada), where I was a mentor. In both, the impact generated in each of these beings to become climate leaders and continue to generate awareness in their countries, I think it is a more efficient compensation meter. Or is it not the fact that, after my talk, these young people of Buenos Aires are going to present ideas to local legislators to develop laws that have climate change as the main topic? 10 years after its world premiere, and with obvious data that is still updated in each of the presentations of the organization, “An Inconvenient Truth” is still a documentary to have reference to remember that climate change exists, but especially to understand again that no matter how much or who we make feel uncomfortable, it is a truth that, since then, has promoted climate action around the world. If you did not watch it, it’s never too late. If you watch it, I’m sure you’re giving your contribution in the action against climate change.